We are a growing group of concerned Takoma Park, MD residents who oppose the rapid rollout of a dense network of "small" cell antennas for current 3G and 4G, and future 5G wireless technologies emitting radio frequency (RF) radiation, without proper investigation into their effects on the environment and the health of humans and wildlife. We are concerned about FCC orders and other federal restrictions that aim to strip away local authority over cell tower siting and prevent using health concerns in decision making. We also face a new telecom-friendly bill in the Maryland General Assembly that would shrink our local authority over cell tower decisions even more. And behind it all: Intense pressure from the wireless industry to be free to pack these facilities in our neighborhoods as densely as they choose—and as close as they like to our homes, schools, offices and parks. Are you new to the subject of small cell wireless & 5G? This video gives a good overview. - everyone will be affected in ways that matter to them! To engage the City of Takoma Park and our Montgomery County, State of Maryland, and federal governments in advocating for the protection of the health and safety of residents and the environment in their laws, policies, and regulations on these matters. What is happening with 3G/4G cell antennas, small cells and the new 5G in Takoma Park and Montgomery County? For years Montgomery County Maryland residents have been voicing their concerns on the health, safety, security, privacy, zoning, and equity issues surrounding the siting and permitting of wireless transmission facilities in their neighborhoods. This ehtrust.org article, "Maryland Residents Halt Small Cell 5G Pre-emption Bill and Continue to Fight 5G at Local Level" provides some background. Here are a few testimony videos from the Montgomery County Public Hearings on ZTA-18-02 and ZTA 18-11. Several Residents speak during the public commenting at the Montgomery County Hearing on Small Cells Near Homes April 2, 2018. Rick Meyer, President of Montgomery County Coalition for the Control of Cell Towers (mc4t.org) describes issues with the cell tower permitting process and mistakes made. That proposed new law, ZTA 18-11, would have changed the current setback (the distance towers must be from buildings) from 60 feet to 30 feet in residential zones. Thanks to strong resident opposition and the responsive leadership of County Councilmember Tom Hucker, it failed to pass. But earlier in 2018, another proposal did pass, reducing setbacks in all commercial and commercial/residential zones to just 10 feet. That includes any residential apartment or condo building in such zones! So small cell towers can be placed as close as 10 feet away from the homes of Montgomery County residents who live in such zones -- many of whom are renters, often with low or moderate incomes, often families of color, and often immigrants. OUTRAGEOUS!!! Many of us attended the Teach-In November 30th organized by Community Vision For Takoma (CVT) on the health, safety, and equity issues around small cell towers and related new 5G technology, and very actively advocated for strong provisions in the City’s related new ordinance to protect the public interests as rigorously as possible. We’re working now to help make sure the regulations to implement the new ordinance – which the City hopes to finalize by early April – are also as strong as possible. Read more on the Take Action - City of Takoma Park page. View the Take Action-Maryland page to learn more about the Maryland State bills that silence our voices and likely obliterate local laws – laws that we as a community have crafted to protect our homes and families. These bills will allow telecommunication companies to place their cell towers with little to no regard for the safety of our community. While Maryland considers small cell legislation, the City is working on drafting the regulations. Let the Mayor and City Council know you expect residents to be informed and consulted early and often as City regulations are drafted to implement our new ordinance. 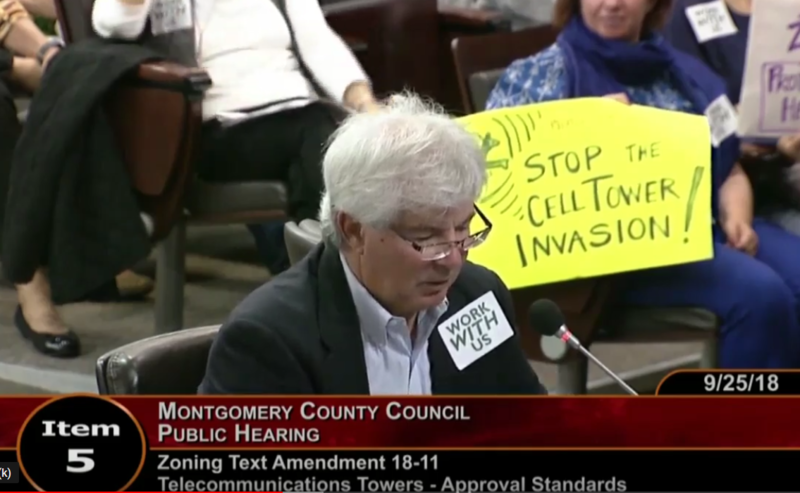 Insist we be notified right away as applications for cell towers in Takoma Park are received. "Cell Tower Administrative Regulations Update The City has engaged attorney Mark Del Bianco to assist with the development of administrative regulations consistent with the Council’s recently adopted Ordinance that amends the City's Code pertaining to Permits and Improvements in order to regulate the installation of telecommunications equipment in City rights-of-way. Mr. Del Bianco has over 25 years of experience with communications law. 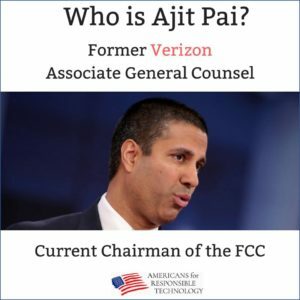 Over the last two years, a large part of his practice has involved advising residents and concerned non-profit groups on small cell zoning and rollout issues at the county, state and federal levels (see, for example, https://nextcenturycities.org/wpcontent/uploads/Guide-to-FCC-Small-Cell-Order.pdf). The general goal of these projects has been to maximize – within the framework established by the governing federal and state laws and regulations – local control of the small cell rollout process and consideration of the concerns of local stakeholders." "Transmission Facilities Coordination Group (Tower Commission) Update Just this morning, the Chair of the Transmission Facilities Coordination Group contacted the City to let us know that she had received approval from the County Executive’s Office to have a representative of the City appointed to the group. Public Works Director Daryl Braithwaite will be our representative and Construction Manager Ian Chamberlain will be the alternate." To learn more about existing and proposed cell antenna and cell tower locations in Takoma Park, view the Takoma Park Cell Antenna and Tower Information page. Where are the current wireless transmission facilities & cell antennas located? How can I find out where new cell antennas or new towers are going to be installed? 5G “small” cell antennas are to be placed in neighborhoods everywhere. The radiation from small cells is not small. 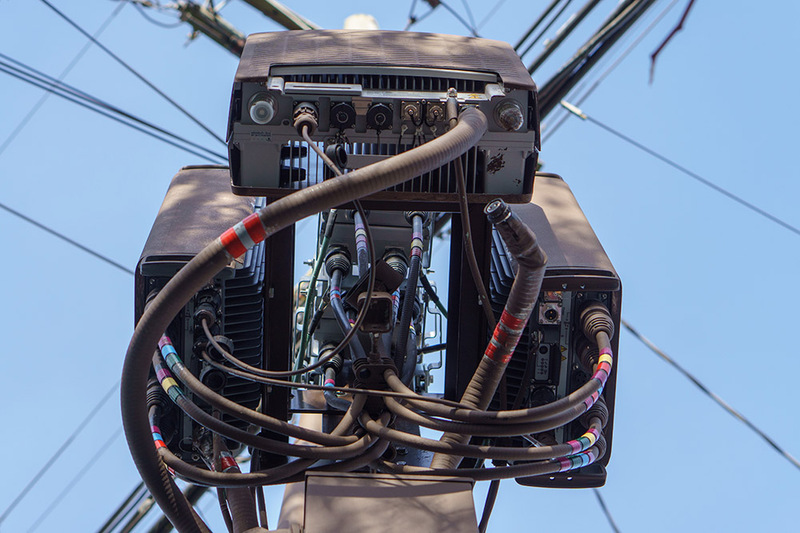 Millions of small cells are to be built in front yards in the name of 5G. 5G will add an extra layer — not replace — our current wireless technology. Community authority is being overruled at every level. Cell phone companies have confirmed that 5G “small” cell towers do not need to be placed every hundred feet (despite industry statements that densely placed small cells are needed in close vicinity to homes). Scientists worldwide are calling for a halt to the 5G Roll-out. Cumulative daily radiation exposure is associated with serious health effects. Scientists state that wireless radiation is a human carcinogen. Antennas near homes decrease property values. 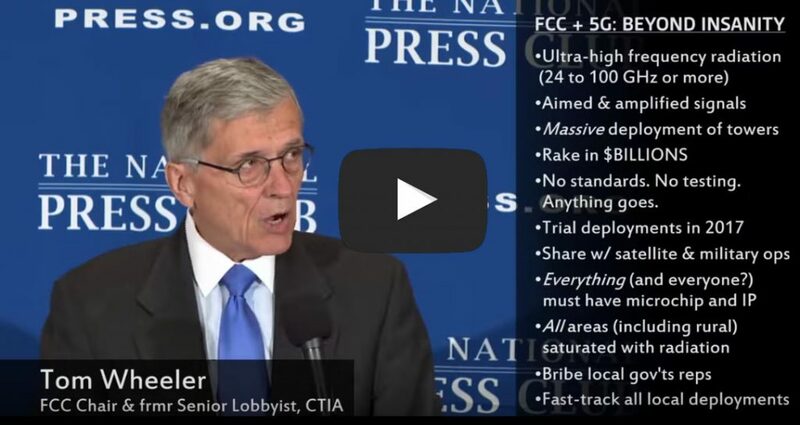 Experts state that 5G Small Cell Wireless streaming bills do not make financial sense. 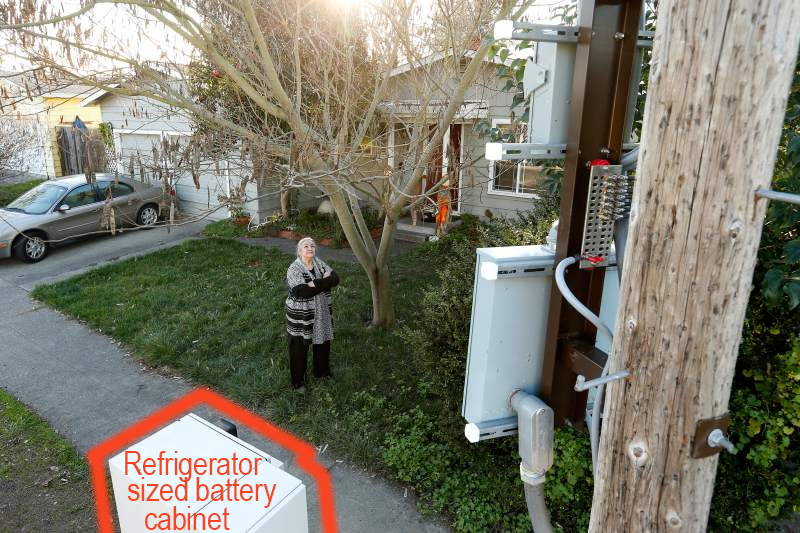 Microwave antennas in front yards present several worker and public safety issues. Fiber is the solution and the safe alternative. Wireless Companies warn investors of risks but neglect to inform consumers and neighbors living near towers. Antennas near our homes will affect our sleep. The FCC is not monitoring radiation exposures from cell installations and many cell towers are in violation of the radiation limits. The American Academy of Pediatrics is one of many medical organizations that is calling for federal action to protect children. Firefighters fought hard to oppose 5G small cells in California. 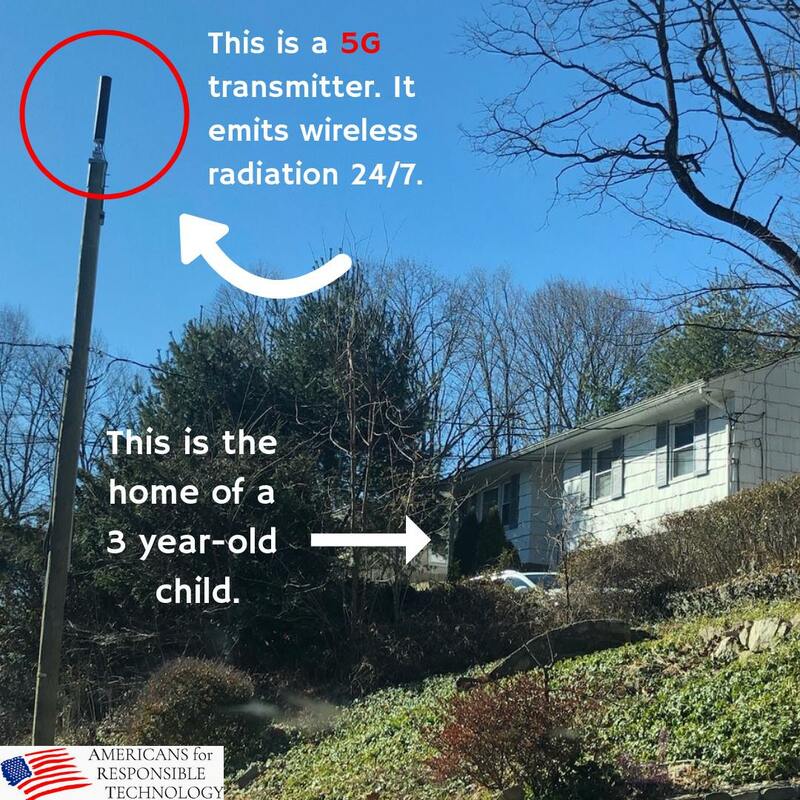 Learn more about 5G & Small Cell Radiation Risks and watch testimony from our neighbors in DC and surrounding Montgomery County cities at public hearings in the subsection Resources. I see “5G" in my WiFi router and phone, does this mean they are already using 5G? No. The “5G” you see in WiFi routers means “5 GHz”. This is NOT the same as actual 5G which means “5th Generation” infrastructure. Actual 5G (“5th Generation”) is planned to operate at 25-90+ GHz frequencies. Is it just a coincidence that we see this “5G” option popping up? Or a purposeful attempt to get people to gain acceptance and familiarity with the term 5G? Long-term exposure to these higher frequencies has never been tested, although exposure to the lower frequencies of 2G and 3G have been linked to cancer, immune dysfunction, infertility, altered brain development, sleep and memory disturbances, and many other adverse health effects. "The "race to 5G" is not really a race at all, except perhaps among wireless companies to see who can be first to market with their products and services. 5G will not necessarily bring broadband to under-served or rural communities; fiber-optic cable is still required to do that. It will not solve the digital divide; 5G will offer faster download speeds, but it will come at a hefty price for consumers. And 5G will not immediately improve cell phone service, or assist first-responders in an emergency. It's not required for autonomous cars. Then what's the real purpose of 5G? 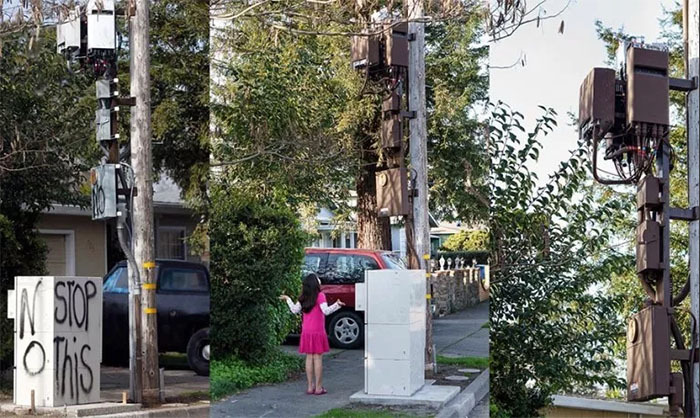 This massive build-out of "small cell" wireless infrastructure is to enable telecom companies to beam their signals into homes and apartments without having to install a cable. It's that simple. " Read more at telecompowergrab.org. Watch an edited version by Josh Del Sol on YouTube. Be sure to catch what Tom says in the NPC video at time 15:10: "Yes 5G will connect the Internet of Everything. If something can be connected it will be connected in the 5G world. But with the predictions of hundreds of billions of microchips connected in products from pill bottles to plant waterers. You can be sure of only one thing, the biggest Internet of Things application has yet to be imagined." Join The Intercept’s senior correspondent Naomi Klein and Harvard Business School professor Shoshana Zuboff, author of “The Age of Surveillance Capitalism: The Fight for a Human Future at the New Frontier of Power,” for an engaging discussion about the unprecedented form of power called “surveillance capitalism” and the quest by corporations to predict and control our behavior. Author Shoshana Zuboff - Time:18:00: "They call us users, and yet here we are across countries, across cities, experiencing so many of the same concerns. I say we are not users. I say we are bound in new psychological, social, political, as well as economic interests… that we have not yet invented the words to describe the ways that we are bound. We have not yet invented the forms of collective action to express the interests that bind us, and that is a big part of the work that must follow in this year, and the next year, and the year after that, if we are to ultimately interrupt and outlaw what I view as a pernicious rogue capitalism that has no business dominating our society." At Time 1:23:39: "I believe that we will discover the new forms of relevant collective action and we're already seeing this around the world I've just been in in Brussels where I spent time with Francesca Bria who's the chief technology officer for Barcelona I'm sure some people in this room knows know what's going on in Barcelona where they're you know they're they're trying to do the smart city in the way that we own it that it's our data our lives and our city that the smart city is a democratic municipality it is the citizens city". It isn't too hard to conclude that the massive build-out of "small cell" wireless infrastructure will be an amazingly huge enabler of surveillance capitalists and their partners in the surveillance industrial complex. Take action and protect your neighborhood from the Telecom land grab. How can we reduce our radiation exposure? Please view our subsection "Resources" for information. Use corded phones at home. Keep cell phones on airplane mode when not texting or making calls, use speaker or air-tube headsets on calls, and keep all wireless devices away from the body. 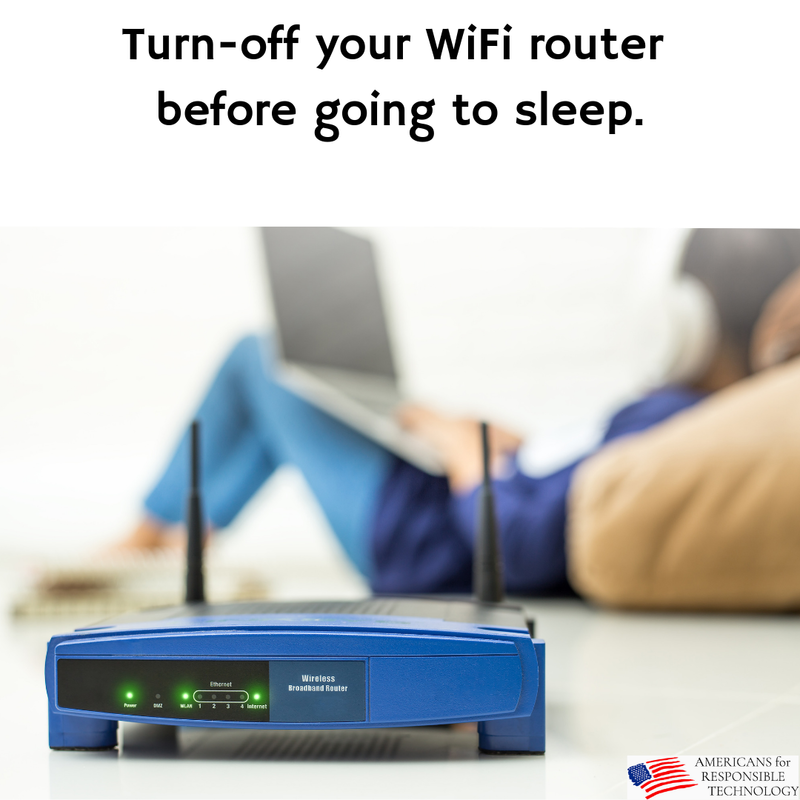 Turn off your WiFi router at night and other times when you don't need it. Wire your devices with ethernet. What if my neighbor's wireless radiation is reaching our home? Talk to them. Many people are unaware of the risks of wireless radiation. Share information on social media, your email lists, and parenting groups. What can I do about smart meter radiation? There are a lot of folks organizing around the country on this issue. Internet searching yields this group: Maryland Smart Meter Awareness. Many routers have a calendar function for setting the on/off times. Take action. Stay informed and tell your neighbors. Connect with Tech Wise Takoma Park! Why are so few people aware of the dangers of RF microwave radiation? We encourage you to do your own research, draw your own conclusions, and act accordingly to protect yourself and those you love. Talk to your neighbors. Help bring awareness to small cell wireless technology, 5G, and the un-democratic dynamics in play.